That night, we had a mini nomikai (social, drinking party) at Mari’s mom’s. I allowed her friends to practice their excellent English with me as long as they let me practice my horrible Japanese in return. I’ve noticed a trade-off between comprehension and speaking ability when drinking. As I drink, the less I understand, but the more I speak. I’ve confirmed this phenomenon with other non-native speakers of Japanese, seems I’m not alone. All in all, it was pretty fantastic, and I learned some dirty (albeit entirely useless) Japanese phrases. That’s cool too. Saturday was lunch in Yokohama with Mari, Hanako, Aki, and Yoko. They let me choose which type of food, so naturally I choose donburi (remember my cookbook). Specifically, katsudon. Yum! I can’t get enough of that stuff. Eggs, rice, and meat, yes please! After a lovely lunch, I hopped on the train back to Koga… well I though it was heading to Koga. Actually, it did, for quite some time. You see, Japan is famous for their transportation system. It’s efficient, streamlined, and rapid. Only problem? It’s incredibly complicated. I’ve tackled subways all over the world, but they’ve got nothing on Japan. The Washington D.C. Metro is like reading a children’s book, while Tokyo is like reading a post-graduate thesis on a topic you have no knowledge of. Long story short, my train had the correct name and route for all of 45 minutes, then it took a Northwestern turn. It took 3 stops to notice, but by then I had lost 20 minutes round-trip. After figuring the train out, I managed to make it into Koga just in time to attend a going away party for another ALT in Koga. I’m so glad I went! The ALT who is leaving, Khalil, is a great guy, and even though I just met him, I’m already sad to see him go. Also, I met other ALTs in Koga and had the pleasure of making some Japanese friends, too. We all got along exceptionally, and I can’t wait to see everyone next. A few of the ALTs and I are going to drive to Nikko today! Sunday was the best day out of the lot. 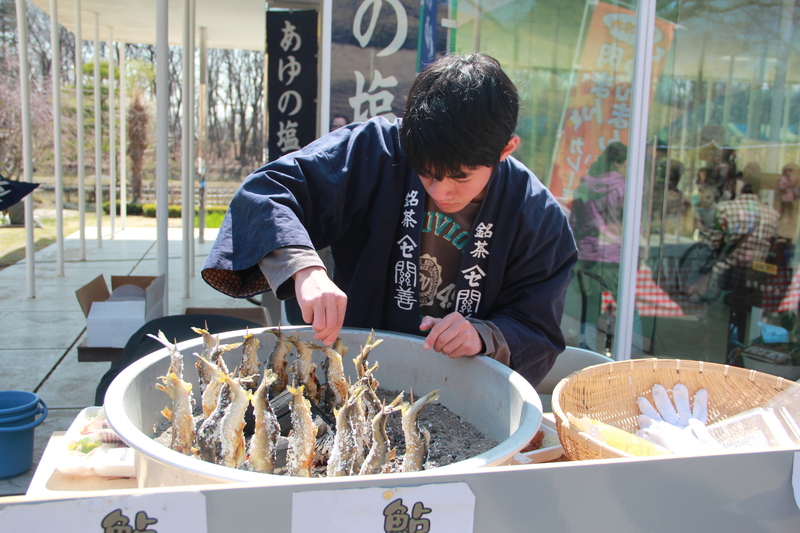 It was the Peach Festival (Momo Matsuri)! 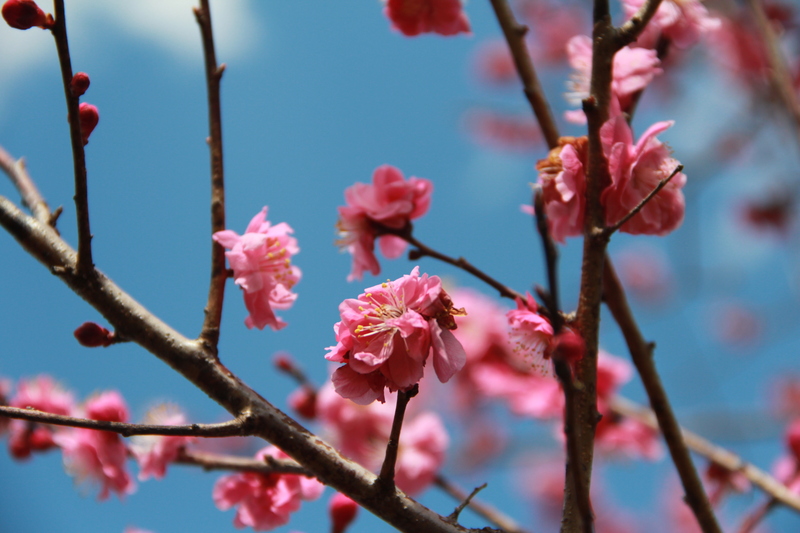 The peach blossoms are just about to bloom, and some already have. I’m sure they will be in full bloom next Saturday when I return. The festival was filled with all kinds of crazy food. There were chocolate covered bananas on a stick, and there was also fish on a stick. You could get sushi, yakisoba (think mall japanese food noodles, but done right), okonomiyaki (depending on which region it’s from, this is usually noodles, egg, cabbage, not particularly in that order), takoyaki (octopus and bread fried on a stick, in ball form), gyoza (pork dumplings), all different flavors of sake, teas, and lots strange things I don’t even know what they were called. I bought a box of peach manju (a bun filled with red bean paste) and really wanted some peach tea. There were vendors that you can tell are at all festivals, then there were the local ones. 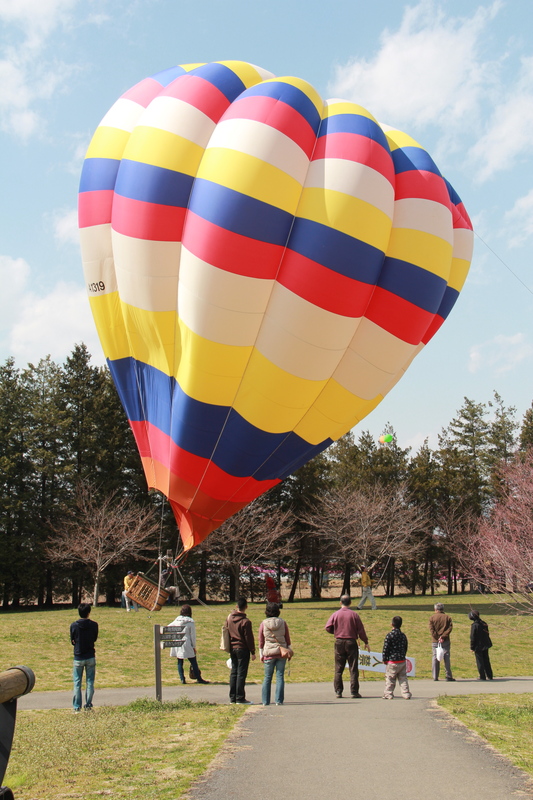 Aside from the food (which is sort of the main attraction), there were performances happening on the stage, festival games for kids to play, people hanging out on picnic blankets enjoying the weather and the blossoms, and there was a hot air balloon attraction! So many sights, smells, and sounds, it was almost a sensory overload! Going to a festival in Japan was nearly top of my list. I’m so happy I got to go, and in my first week! It was a ton of fun. We even took a walk away from the festival to uncover the park and a neighboring park. I’ll be attending next weekend again, as some friends are coming to town! Also, I hope to go to hanami (cherry blossom viewing) on Sunday in Tokyo. This week, I get to meet my teachers and attend the opening ceremonies at school on Friday. I can’t wait to meet the kids! Rub me for intellect bonus! I don’t know which I like better—the pictures or the post! And the rubbing of the bull wearing a bib is a hoot and a half. So super jealous. That flowers and decorations are beautiful!I love how many celebrations that Japanese seem to have. We’ve being sharing your post about Koga’s Peach Festival to invite people to join the festivities, we like it better than the city info page. We are Koga Hot Air Balloon Club and we are taking part of this event. It’ll great if you could join us. Hi Paco! I’m so sorry, I’ve only just seen this comment. I hope this year’s festival was lovely! I don’t live in Koga any more, but I’m glad the post has been enjoyable. Let me know if there is anything else I can ever do to help out with promoting the Festival!